Your holiday decorations for your dorm room decor are going to be focused on your dorm Christmas tree. Your college Christmas tree is the largest dorm item for your holiday dorm room decorations you will have in your college dorm room. That means your dorm Chrismtas tree needs to make an impact. You don't want to leave the branches of your dorm Christmas tree bare. Doing that won't add much to your dorm room decor for the holidays! When you're dorm room decorating for the holidays, don't forget to add our 9'x14" Black Fir Garland with Mini Lights to your college dorm checklist. Our Black Fir Garland with Mini Lights is a unique holiday dorm room decorations piece. First of all, the tips of this dorm essentials item are black! You may not often think of black as a color for your holiday dorm room decorations, but the truth is it looks amazing. Black is a neutral color that goes with anything, so whether your dorm Christmas tree is champagne colored or bright purple, this dorm necessities item is going to pull all those holiday dorm room decor color themes together for a really cool look that will make your college dorm room feel like a home away from home. Plus, since this dorm essentials item is a black color, you can even add some extra dorm room decorations to your college room decor for Halloween by draping this dorm item around your dorm desk! 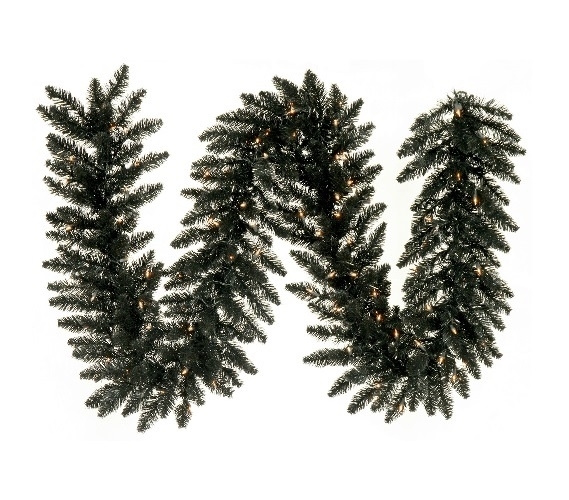 Our Black Fir Garland even has clear mini lights on black wire wrapped with the garland for extra dorm room decor!